Pap sent me incredible letters I will always hold on to. He was sharp, dependable, and I hope I have half of the gumption he had. 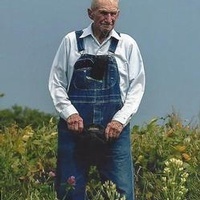 Pap knew what he wanted and got to see Europe and farm and always encouraged/supported his great grandchildren. I enjoyed fall afternoons with him and stories about the farm life and tractors. He cared deeply about the world around him as well as the global current events. I can only imagine his prayers were heartfelt. Love you, Pap.